For a fancy grocery ad you want just the right font for your vegetables: Maybe or or . Or maybe another other of your 300-odd fonts. 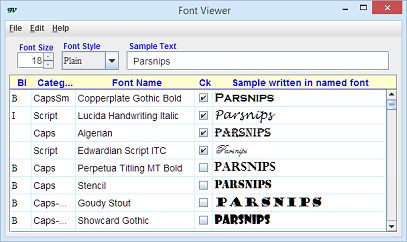 FontViewer shows you all the fonts and lets you see "Parsnips" in each. In any font size and your choice of bold or italic. 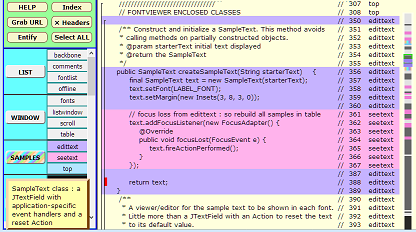 FontViewer's source code can be explored with SourceExplorer to study the flesh and bones of a Java Swing application. Click this screenshot to view it live.